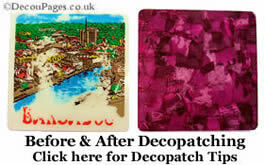 Decopatch is the modern take on the centuries old craft of decoupage. Strictly speaking, Decopatch is the trade name of the French company that makes the special papers, glue etc, but it has rapidly become a generic term. Another popular brand is Deco Mache. 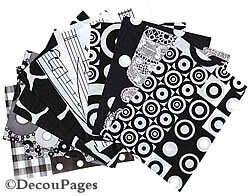 Deco Nouveau and Artepatch are another 2 brand names to look out for when looking for decopatch papers. Objects are decorated by sticking special Decopatch paper to the surface. Often an overlapping patchwork of small pieces of paper are used. Use a single paper design or mix and match your papers. You can also create collages using motifs from different papers. Decopatch papers have been specially designed to resist fading and the colours don't bleed or run when used with the Decopatch glues and varnishes. Decopatch papers are strong yet flexible. Decopatch papers are also very thin so ridges don't form at the overlap points. Decopatch glue-varnish, called paperpatch, gives a high quality finish without the need to sand the object or for a separate layer of varnish. Decopatch glue-varnish makes it possible to decorate a wide variety of surfaces including card, papier mache, wood, glass and ceramic. Special high gloss or matt varnishes are available as well as glitter glues. Aquapro varnish gives a more resilient water resistant finish. All the Decopatch glues and varnishes are water based, so there are no nasty fumes. It also means you can clean your decopatch brushes by washing them in warm water. Tresors (French for Treasures) are mini jewels and other stick ons used to decorate the finished object. Patchliner is another product you will come across. It is used to give raised areas of colour like icing on a cake. It can also be used to stick Tresors to the finished object, a trick often used for adding eyes to papier mache animals. For large scale work you may want a brayer. These mini rolling pins were originally designed for printwork, but are useful tools for removing air bubbles from under larger areas of paper.